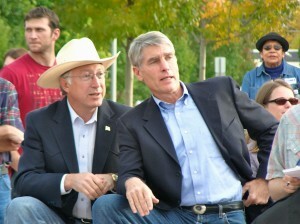 Ken Salazar and Mark Udall. Ken Salazar, the unannounced leading Democratic favorite to run for governor next year, will not run because of family reasons. He softened the blow by quietly informing everyone through a commentary submitted to the Denver Post. Among the challenges Colorado faces as a state is turning around pockets of “economic distress,” especially in rural areas, Salazar said. A state population that is expected to grow from 5.4 million to more than 8 million people in the next 25 years will present challenges, he said. Environment, transportation and education will be among the chief concerns of the next governor. We suppose serving nearly a full term in the U.S. Senate and a term as Interior Secretary was enough public politics for the 62-year-old. That leaves former state Sen. Michael Johnston of Denver as the only person to file papers for the Democratic gubernatorial primary. Also waiting in the wings to run on the Democrat side are U.S. Rep. Ed Perlmutter and former state Treasurer Cary Kennedy. We’ve noticed that Perlmutter has gotten a lot more active on the Twitter lately. If he actually shows up on the floor and starts speaking, that could mean he’s getting serious about his political ambitions.